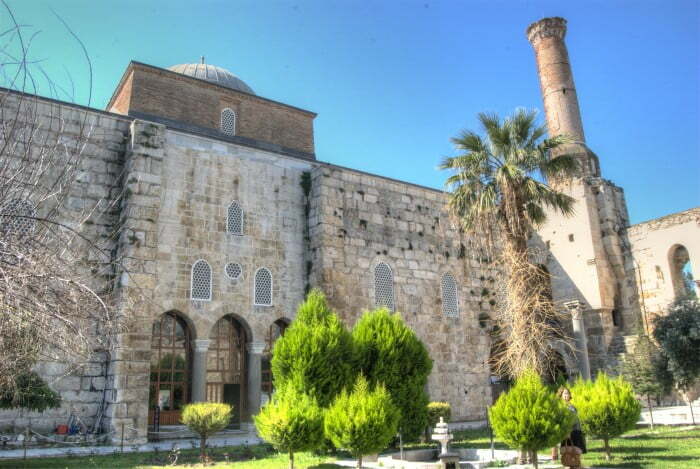 Situated in the heart of Selcuk town at the bottom of a hill, Isa Bey Mosque was originally built in 1375 in honour of the ruler of the Selcuk region from 1360 to 1390. 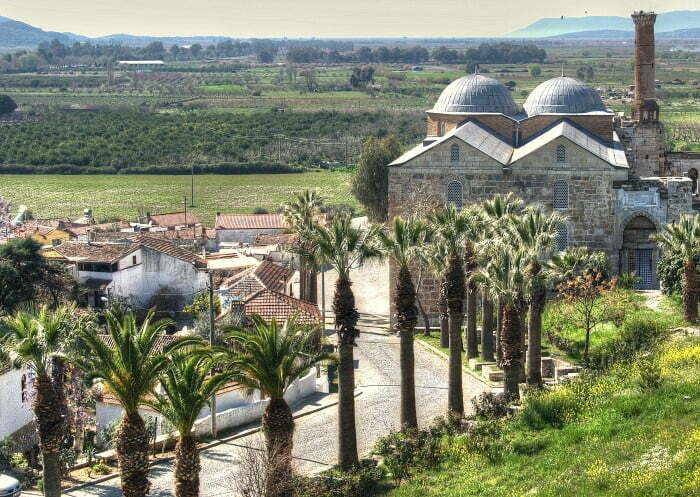 It doubles up as a place of worship and one of the major touristic attractions of the town. 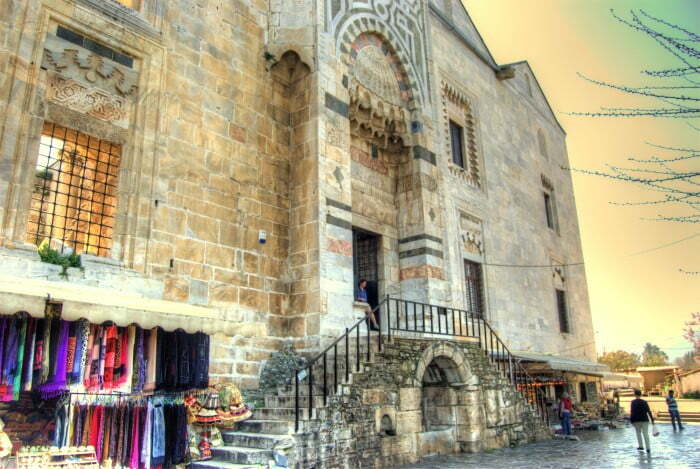 Standing in front of the tall walls, next to the entrance of the mosque were shops. 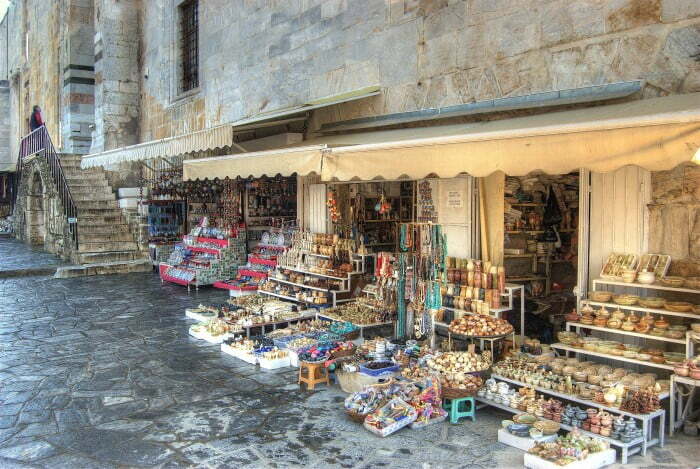 The sellers knew the standard banter used throughout Turkey, to entice tourists to purchase souvenirs of which I suspect many people do not actually want. Browsing through the shops, I specifically looked for an informative guidebook about the mosque yet none of them stocked it and the sellers were surprised to hear my request as if I would instead be interested in a Turkish evil eye or coffee cup with the Turkish flag on it. 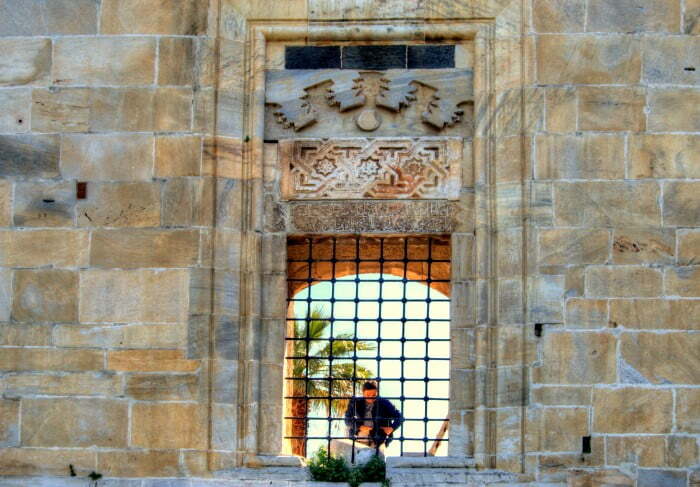 Leaving empty handed, I walked up the stone steps through the elaborate entrance resembling typical Selcuk architecture and into a pretty courtyard. On the far side of steps were hordes of tourists, presumably waiting for their guide. It looked like I had timed my visit well to miss them all because large crowds when I visit tourist attractions just annoy me. 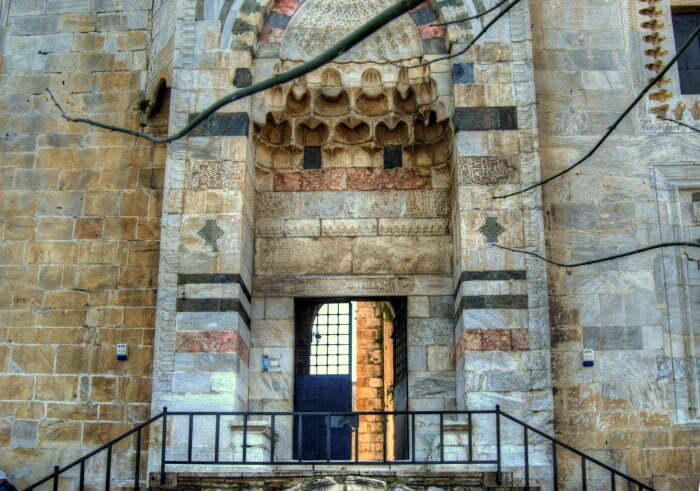 A sign said two minarets used to tower on the east and west sides but, unfortunately, this building was not the original 14th-century version because earthquakes in 1653 and 1668 caused a considerable amount of damage. Refurbishment and restoration took place in 1975 and 2005 that made it into a simple, yet immaculate structure that is pleasing on the eye. 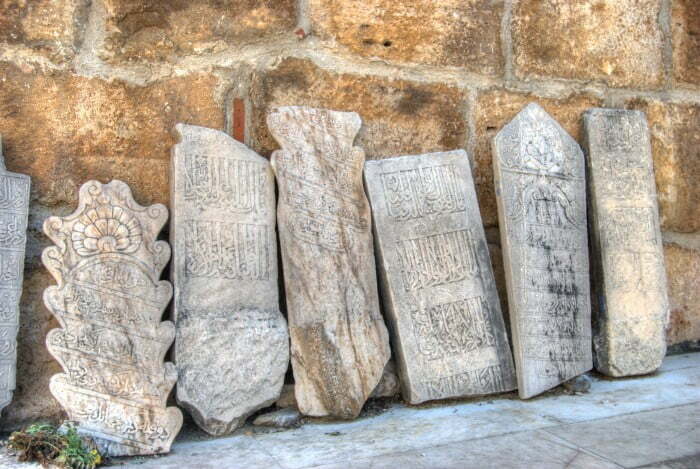 Passing by Ottoman gravestones leaning against a wall, I went into the main prayer area where signs in English displayed standard rules that men should wear trousers and women should cover their head and legs.I was prepared and covered my head with a silk scarf before looking around. 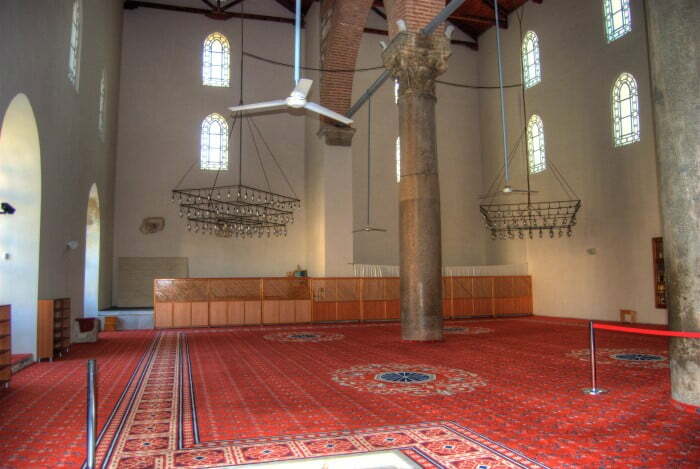 The mosque was similar to others, in that it was pristine clean. 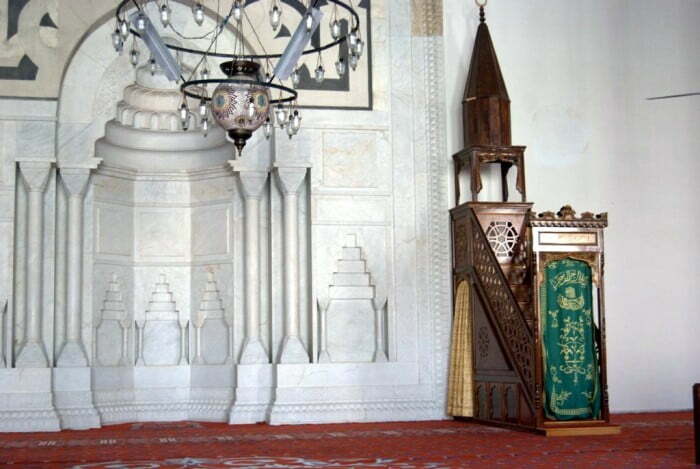 It amazes me because every mosque I have seen has a carpet that looks brand new and never used. Do they employ cleaners just to look after the carpet and nothing else? I looked around slowly, but there was no historical evidence of what I could see. The outside of the building was more interesting than the interior. Apart from the intricate chandelier hanging from the ceiling, it looked just like any other mosque. Maybe it is a case, of once you have seen the Blue Mosque in Istanbul, everything else pales in comparison. Feeling deflated, I left shortly after and cursed the souvenir shop sellers for their lack of reading material. It is times like that when tour guides really do come in handy. On the other hand, it was just bad timing. Had I arrived 20 minutes earlier, I could have tagged onto the tour group.